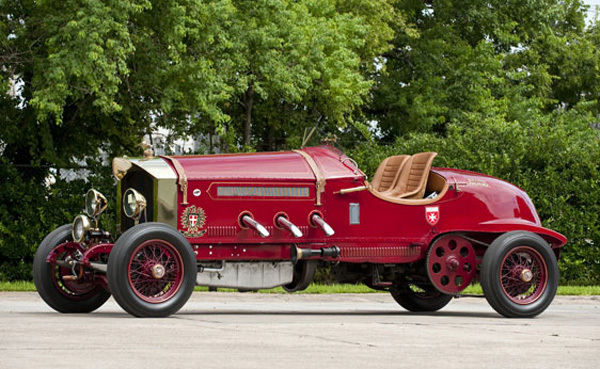 Mark Hyman’s 1919 LaFrance Speedster, or La Bestioni, spits, belches and rumbles to life as if a medieval spirit were awakening from a long slumber. In a way, it is. This open-wheeled monster was the brainchild of Californian Gary Wales. He wanted to create a vehicle that paid homage to two of the monstrous, heroic racers from the early 1900s, the Mercedes-Benz Blitzen Benz and Fiat’s Beast of Turin. Both set speed records. In 1910, the Beast of Turin, with a 28-liter, four-cylinder engine borrowed from a dirigible, was clocked at 145 miles per hour. That, Wales said with a laugh, was at a time when “people thought your face would blow off at any speed higher than 70 mph.” The Beast of Turin’s engine was more than nine times larger than the V-6 in a Honda Accord, and its cylinders were so large, Wales said, a man could stick his head in one. When it drove down the road, he said, flames shot 10 feet out of the exhaust and people ran for cover. Wales started with the frame and 14-liter engine of a LaFrance firetruck and added a handmade, aluminum body that is 18 feet long and more than 6 feet tall. Six Harley-Davidson carburetors feed the six-cylinder engine, and three exhaust pipes the size of downspouts dump their raw sound in front of the driver. However, La Bestioni is not just a visual caricature. It is a real, drivable machine. It has power steering, power brakes and a four-speed manual transmission. Two large sprockets with chain drive turn a Ford differential. Wales recounts how he came up with the name. His friend asked a waitress at an Italian restaurant how to spell beast in Italian. “La Bestioni,” she said, giving it a feminine gender. Hyman, owner of Hyman Ltd. Classic Cars in St. Louis, recently took ownership of this amazing machine. It is for sale for $225,000.